The objective of this study is to precisely quantify the forest aboveground biomass (AGB) and carbon stock in a tropical deciduous forest with synergistic use of space-borne L-band ALOS PALSAR and X-band COSMO-Skymed SAR data, along with field inventory data. AGB serves as a decisive parameter for preparing global decision making policy targeting the impact of reducing emissions from deforestation and forest degradation and climate change. 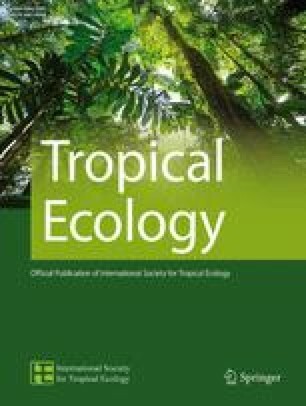 The study proposed optimal regression models for assessing above-ground bole biomass over tropical deciduous mixed forests of Munger (Bihar, India) with synergistic use of ALOS PALSAR and COSMO-Skymed sigma nought images. Coefficient of determination (r2) of 0.89 and RMSE of 15.12 Mg ha−1 were calculated for the best fit integrated model. On validation, the integrated model produced a model accuracy of 78%, r2 = 0.89, RMSE = 16.64 Mg ha−1 and Willmott’s index of agreement of 0.934. Resulting modeled AGB were converted to carbon and carbon dioxide equivalents using conversion factors. L-band showed higher accuracy in the estimation in comparison to X-band; but the estimation accuracy improved with the synergistic use of both X- and L-band SAR data. Hence, the study recommends the combined use of X- and L-band SAR with exceptional capabilities for improved assessment of tropical forest stand AGB and carbon with significant contribution towards operational forestry and policy making. This work was supported by the Science and Engineering Research Board (SERB), Department of Science and Technology (DST), Government of India under Grant [File Number: PDF/2015/000043/EAS].